We are getting an error while adding actions in Social Studio. Please refer to the attached image. Wanted to know what is the limit of no. of licensed actions that we can define for the rules in Social automation. I have tried to add Social Media Connector - Twitter account on Pardot. I have signed in and authorised the Twitter account but it is displaying the following error. I have tested the Twitter username and password and it is correct. "Could not verify Connector. Warning: Your Salesforce connector user does not have all the permissions that Pardot expects. If this is not intentional, have your Salesforce admin grnat all permissions listed in this Knowledge base article for full functionality. If this is intentional, you may dismiss this message, but exercise caution. Restrictions imposed on the connector user affect your entire Pardot instance." Click the 'View missing expected Salesforce permissions for your connector user'. This appears to actually be a problem with the connection between your Salesforce environment and Pardot, your Salesforce connector. The other error, 'Could not verify connector user', is more likely to be referencing your Twitter connector. This occurs when the 'Twitter Username' field in Pardot does not match EXACTLY to the username of the authenticated Twitter user. Have you put '@Username' into the Twitter User field in Pardot? This could be the reason... you'll need to remove the '@' symbol to get it working, and triple check you've spelled this username correct. For example, if your Twitter username is 'AmyF', you'll need to set the Twitter User to 'AmyF', not '@AmyF'. Common mistake here. Please let me know if this helped you, and mark as best answer so it can help others too! If you're still having issues, please don't hesitate to reach out to me and I'll see if I can assist further. if the value "followup call #2" is chosen from picklist "lead stage" , than it must inforce the user to chosse value "Not Relevant " from the picklist "lead Status". please check if the "followup call #2 shouldnt be writen with first letter uppercase. I want to enable Social Customer Service in my Salesforce developer org. what are the steps to be follow for the same. i want to use Social Customer Service for create cases from social media (facebook,twitter etc). please suggest me what the easy way enable to Social Customer Service (Salesforce Classic). I know that canned responses can be done in service cloud, utilising quick text. Is there any way to do this directly in Social Studio? The social studio can help you in publishing tweets in advance. I don't think canned response feature is available via social studio. I am using the engage feauture in social studio and have got a colum set up for all tweets, is there a way to filter out certain posts by keywords ? I can use the filter to search and include keywords but I really need to exclude keywords. Or is there any other way to exclude certain posts from view ? Is your column setup using your Twitter account or a listening Topic Profile? If it is your Twitter account, you can only filter by keyword (or several other attributes e.g. status, media type, post label etc) but there is no keyword exclusion option. Within the Publish tab I assign a label to nearly every post. I'd like to be able to analyze posts by specific labels, but when I try to filter by "post label" none of the labels created in Publish appear. This has happened both in Dashboards, and when I try to drill down to post labels in a Workbench. Are you only able to filter using macros? My name is Roopa. I am located in Herndon, VA. 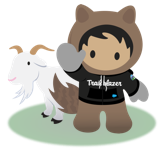 I am looking for a SalesForce Developer Volunteering Opportunities or Remote job opportunity.I am having 1-3 years of experience.I have also earned 25 trailhead badges.Looking to take Certification soon. You can find many non profits seeking help through the non-profit user groups. I have posted to the one in my city and have volunteered hours for ones that needed it. I need some information about outbound message. i have created the Outbound action in my org. but i am not able to test it means what is the end result of it. Or please let me know if there any setting essential for it. 1. Navigate to URL https://requestb.in/ and click on ‘Create a RequestBin’. Now, since RequestBin cannot return an acknowledgement back to Salesforce on the receipt of the outbound message, Salesforce will keep resending the outbound message for next 24 hours. So if you keep refreshing the RequestBin browser window, you will notice that the same message is landing again and again. If you want to stop Salesforce from resending the message again, then just delete the message from Outbound Message Queue in Salesforce. Does Data.com work on Salesforce1? I have been combing the web with no success to see if we can make our Data.com subcription and function work through the Salesforce1 mobile version. I am not seeing that this is possible. Why isn't it? And has anyone found any work arounds? My Marketing Director would love you forever if you could make this work. Thanks!